Le libéralisme économique, c’est la liberté de tuer. La liberté de tuer le climat, donc de tuer les hommes, les femmes et les enfants. 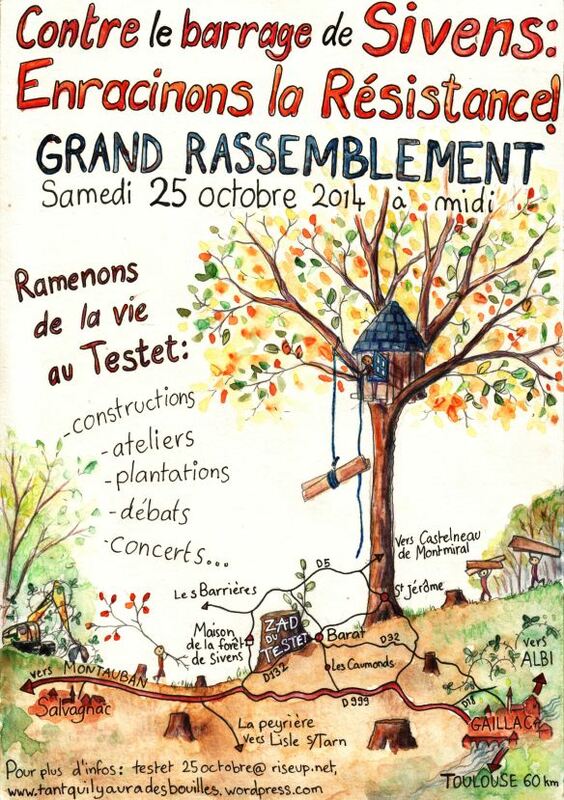 On the night of Saturday to Sunday (25-6 October), 21 year Rémi Fraisse was killed by french police in protests against the construction of a dam; a seemingly and incomprehensibly tragic climax to an almost year long struggle to save a forest wetlands from an agro-industrial development. But the tragic becomes incidental, even insignificant, when read against the ambitions of state-capital; at most, an affair to be managed, lest the indignation get the better of the authorities. Capital, as it imposes obstacles on autonomous creativity, admits in turn no obstacles to the circulation of commodities and the extraction of wealth. Should the latter surge up before it, then they must be removed, killed. The Sivens dam in the french administrative department of Tarn, in the southern Midi-Pyrénées region, was conceived essentially for the irrigation of a handful of corn farmers; an intensively cultivated crop heavily demanding of water and whose principal and almost exclusive end is animal feed. For this, millions in public money are to be spent, while anything resembling a transparent evaluation of the project and “democratic procedure” were quickly set aside. And for this, almost 20 hectares of wetlands forest, plants and animals of great diversity must be destroyed (and a considerable part of the forest already was). The protests against the project began with its approval by local state authorities in October of 2013. Demonstrations and blockades were followed by the creation of a ZAD (Zone à défendre/Zone autonome de déterminée) in February; an assembly based, self-managed collective of resistance/of creation. 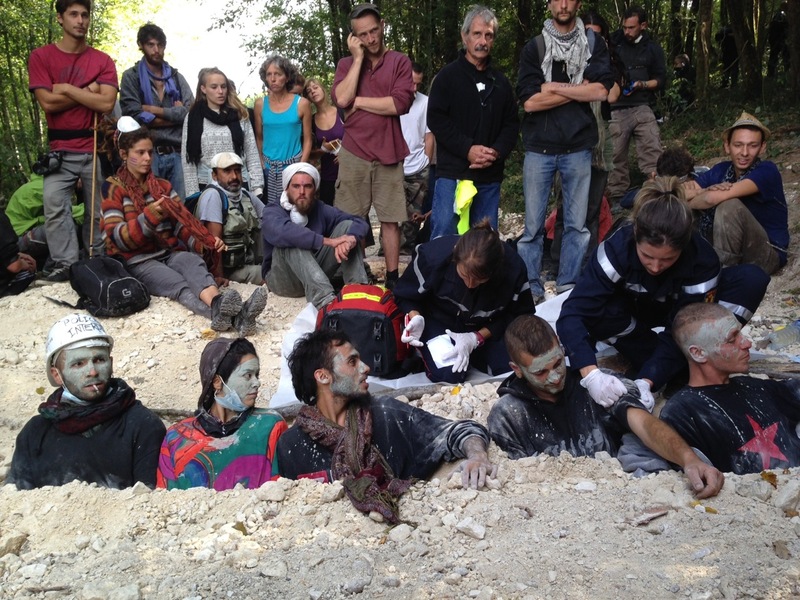 The response from the State was an intensification of repression: harassment, beatings, use of rubber bullets and stun grenades, arrests, the destruction of ZAD activists lodgings, clothing, food and other materials, and all of this unrelentingly, until the killing of Rémi. His murder has sparked protests over the whole of France, and beyond, this last week, and again confrontations with police. For the first time in human history, humans act with/in nature as a whole. There is no longer a beyond nature, either at a local, micro-level, or at transcendent, external level. The world is ours and we belong to it; what we do now acts upon the whole of the globe, only to return upon us. And it is as warriors that we act against the world, in a war that we cannot win. The ZADs point in such directions … and the ZAD can be everywhere. For ongoing news from the ZAD, see the Collectif pour le sauvegarde de la zone humide du Testet and Tant qu’il y aura des bouilles. This entry was posted in Commentary, News blog and tagged ecology, france, Notre-Dame-des-Landes, rebellion, Tarn-Testet, ZAD. Bookmark the permalink.